SF Central Subway is slowest slow motion train wreck in history. Do you like watching bloody transit carnage unfold? You’re in luck, here’s a doozy. Check out these fantastic series of posts on the proposed Central Subway in San Francisco. This is my favorite post of the series. Eric takes exceptional detail in explaining why the Central Subway wouldn’t work as proposed, especially under MUNI’s watch. I agree wholeheartedly: the Central Subway is an unmitigated disaster in process. MUNI’s antiquated metro system is a relic of the ancient past, recently brought to its knees when the T-Third line began service despite nearly a billion dollars of capital investment into the system during that project. The last thing the City needs is to spend a billion dollars more on this piece of crap excuse for a light rail system. Let’s stop writing these ridiculous capital checks to a city agency that can’t handle its current responsibilities. Sure, let’s give a loaded gun to a trigger happy convicted murderer in a crowded stadium! They’re gonna strike again, folks. How about spending this gigantic chunk of change on immediately implementing smart transit options for the City? (Read: Geary + Van Ness BRT to start with.) Is this too much to ask? What do we pay (rather well) all these city planners for anyway? Why can transit novices like me realize the stupidity of these projects while our Supervisors think a Central Subway is the best thing we can do for the City? Hogwash. This entry was posted in politics, transit and tagged central subway, china, chinatown, crap, disaster, fourth, idiots, incompetency, light rail, lrt, metro, muni, planning, rail, san francisco, sf, street, subway, t-third, town, train, transit agencies, transit agency, underground. Bookmark the permalink. 3 Responses to SF Central Subway is slowest slow motion train wreck in history. Just saw the pingback — thanks, I’m glad you enjoyed the posts. I don’t know if you saw or not, but I finally just posted the 5th and last one (a bit delayed). I couldn’t agree with you more on bumping Geary BRT up to the top of the list. If pure transit need was actually the motivation behind the Central Subway, then the whole project would be scrapped, and we’d be working on Geary instead. That image is brilliant, by the way. Check out MapMixer for a way to integrate static maps into Yahoo Maps. It works really well. Eric, thanks for the compliment on the image. 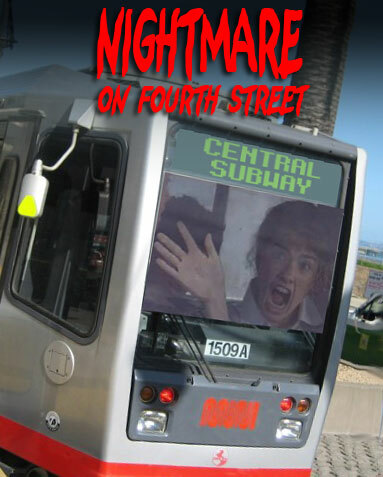 I had fun making the graphic to vent my anger at MUNI.